Are you in the market to sell your home? Have no fear, The Degnan Group at Key Realty is here for you. A well-known fact, the spring season is the real estate market’s bread and butter. With the temperatures warming up and people coming out of their winter hibernation, the spring is the perfect time to hit the market and sell your home. Whether you’re looking to move into a smaller or larger home in the area or looking to move out of state, it’s important to first and foremost, prepare your home for a quick and easy sell. So before you put the cart before the horse and look for your next home, remember, in order to move, you have to sell your own home first — and that requires a little work! 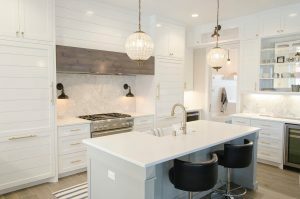 From cleaning your appliances to making sure all your lightbulbs work, use these 9 tips to create an inviting environment for potential buyers. These easy-to-do tips will decrease the time spent on the market, and increase the value of your home! Windows are easy to forget when you’re cleaning your house. On a cloudy day, take a microfiber cloth with a spritz of glass cleaner and get to work! Your windows will be sparkling clean and ready to sell. Lighting is everything when it comes to selling a home. Have you ever noticed when walking through a home for sale, every single light is turned on? Light creates a warm and inviting space for potential home buyers, so make sure all your bulbs are working properly. The floors of our homes face a lot of dust and grime every day. Make sure your floors are clean and vacuumed before potential homebuyers tour the house. The little details add up for a quick sale. If your home consists of mostly carpeted floors, it’s imperative to keep them clean and stain-free. Make sure they’re kept up with consistent vacuuming and stain removing. No one likes to enter a dusty home. It shows that you don’t respect your surroundings which is a major turnoff for potential home buyers. With a swifter or microfiber cloth, get into the nooks and crannies to create a clean, dust-free home. It’s inevitable for potential homebuyers to go through the closets and storage areas. They need to know how much space they’ll be working with, right? Make sure all your closets are easy to access and not stored with clutter. Speaking of clutter, putting your home on the market is the perfect excuse to declutter your home. Go through all your closets, storage rooms, and drawers and throw away or donate items you are certain you won’t use anymore. It feels good to declutter, and will help sell your house, too! Creating a neutral home is key for a quick sale. Remove all of your family photos and make every room as ordinary as possible. Doing so will help potential homebuyers feel like they can imagine themselves in the home without the distraction of your personal belongings. Appliances are easy to forget when doing a deep clean. Make a checklist for yourself to clean the oven, microwave, toaster, refrigerator, stove, dishwasher, sink, and washing machine. The little details matter when trying to sell your home fast.